After purchasing a giant tub of hazelnut butter – because I LOVE it. I’ve become quite creative in its use. I add it to my overnight oats, protein shakes, berry smoothies, cookies – and anything else I can think of! But this recipe is a simple favourite. It’s one that my children keep asking for time and time again. It’s kind of Ferrero Rocher-y in taste, only raw, vegan and minus the sugars. 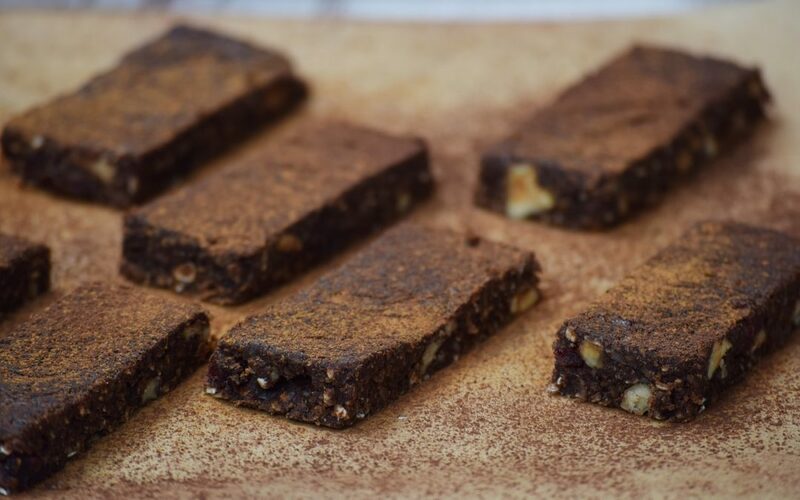 My energy bar is also SuperVegan – using only 6 ingredients and can be rustled up in 10 minutes. How to make your own raw hazelnut energy bars (with suggested variations). Add all ingredients to a food processor. Making sure you stop regularly to scrape down the sides and prevent overheating. Once you have achieved a consistency you are happy with – scoop the mixture out into a lined tray and refrigerate until firm. Cut into rectangles and store in the fridge or freezer. They will last for about a week in an airtight container in the fridge (if you can resist that long!). Try switching the raw hazelnuts to cashew nuts for a creamier taste and texture. To add additional nutritional value to your energy bars, soak the raw nuts of choice overnight, wash and allow to dry either naturally or in a dehydrator. Any nut butter would work here, but my personal favourites are hazelnut and almond butter. The bars can be topped with chopped nuts, desiccated coconut or cacao nibs for additional taste and texture. I would love to know how you get on so please do let me know and send me some pictures!